Health care employers look for allied health professionals who are certified because certification demonstrates that these individuals have the practical skills and knowledge to be successful in their jobs. It also matters which certification your students earn as they complete your allied health programs. 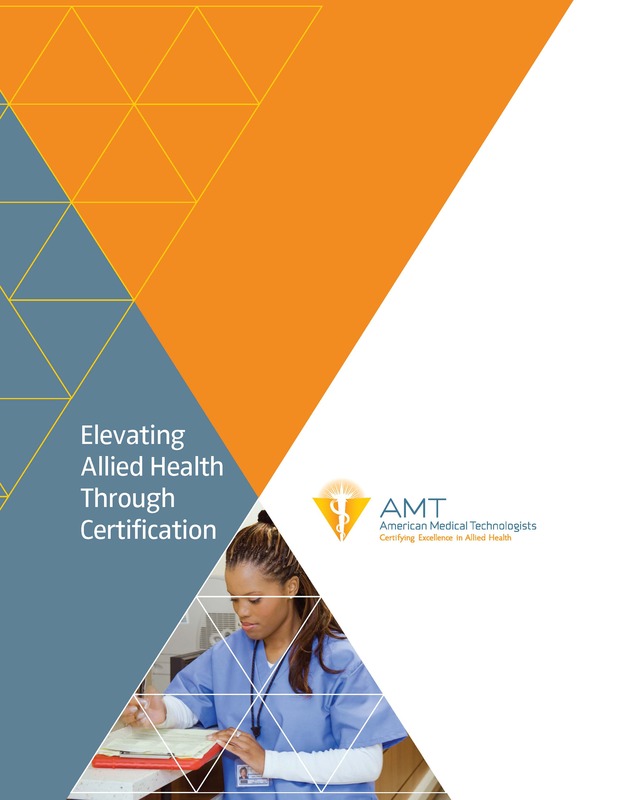 A reputation for excellence: Health care systems and governing bodies prefer AMT to other agencies not only for our decades of experience and industry-recognized expertise, but also because of our nonprofit status and professional membership. When your students get AMT certified, your school’s reputation is reinforced. AMT partners with schools whose students have the requisite training that qualifies them to take and pass an AMT exam. By connecting with AMT through our School Resources Program your school will have access to personalized AMT service, extensive management reports and special purchasing options. 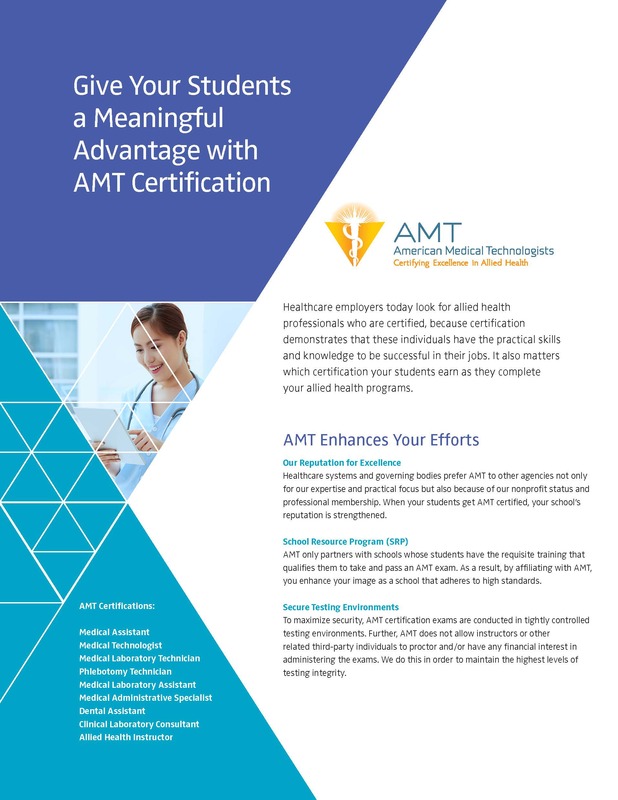 AMT works directly with schools to help your students and graduates get certified. Determine Eligibility to Certify If you are interested in certifying your students, please review our program eligibility requirements to determine if your program(s) qualify. Simply open and complete the appropriate curriculum and demographic form below. Save the form with the name of your organization, and submit it via email or fax to the address on the bottom of the form. 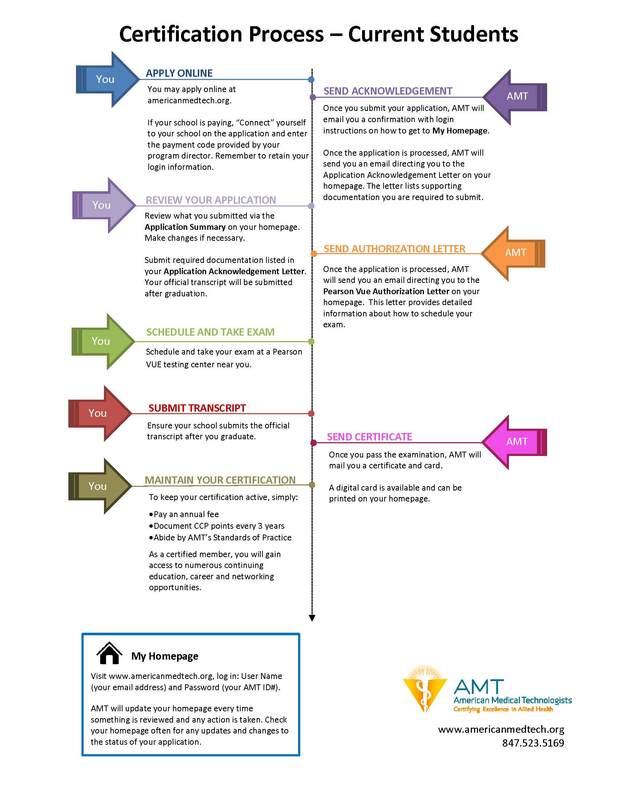 Once AMT has reviewed your curriculum and demographic information, you will be contacted by AMT with information about your AMT Account. 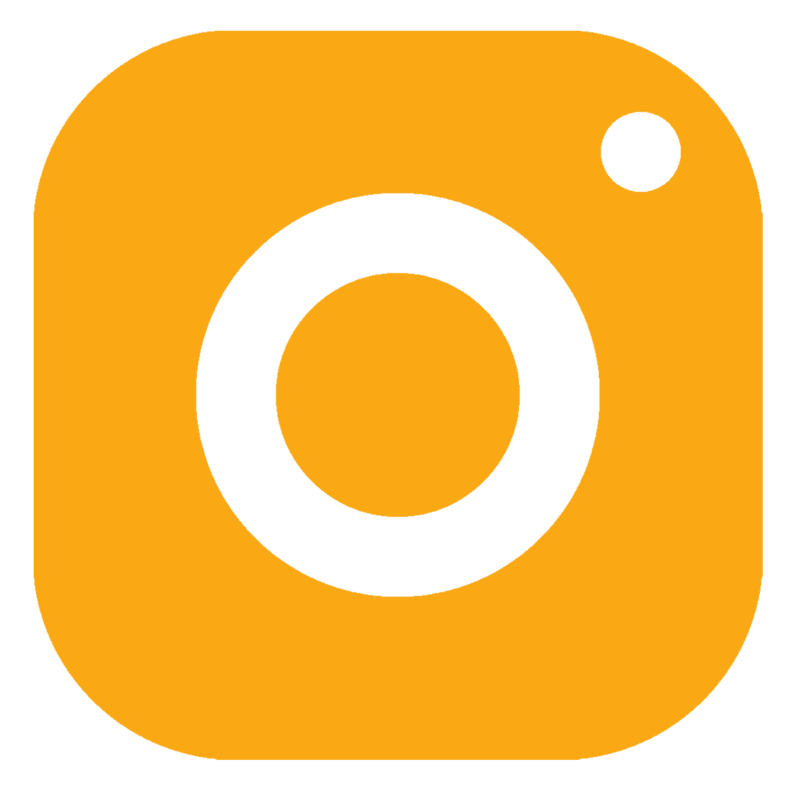 This is an organizational account with an organization ID. When your students or graduates apply for certification, they’ll need to link their applications to your school with your organization ID. This organization account is different than your personal AMT account if you have one. Applications: You will need to provide student applicants with a coupon code, which you receive through the bulk* purchase. Practice Exams: You will need to provide student applicants with an event code, which you receive via email once you make the bulk* purchase. 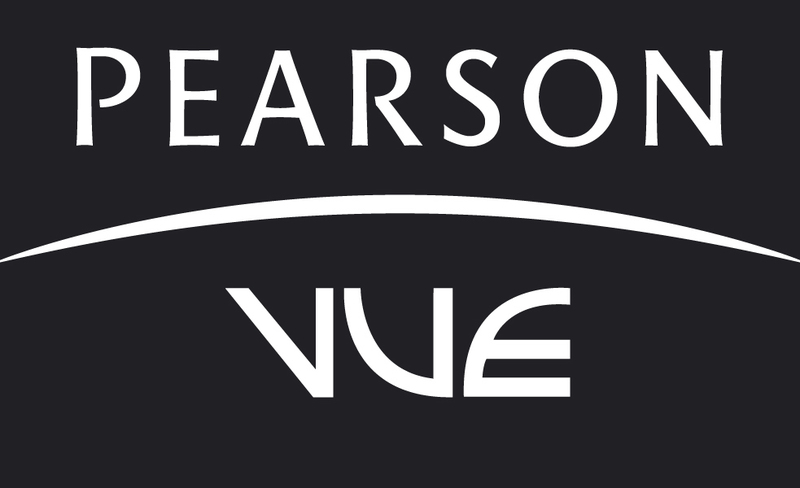 Review Courses: Please contact the business development department via phone or email for details. *The “bulk” purchase process is used even if you only need to purchase a single application or practice exam. Using this process is what generates the coupon or event code you will need to provide your student or graduate. To track all your business with AMT, you’ll have online access to extensive reporting: outcomes data with aggregate examinee performances against a national benchmark; detailed management reports about the status of your students in the certification process; pass rates; and more. To maximize security, AMT certification exams are conducted in tightly controlled testing environments. Further, AMT does not allow instructors or other related third-party individuals to proctor or have any financial interest in administering the exams. This is to maintain the highest levels of testing integrity. 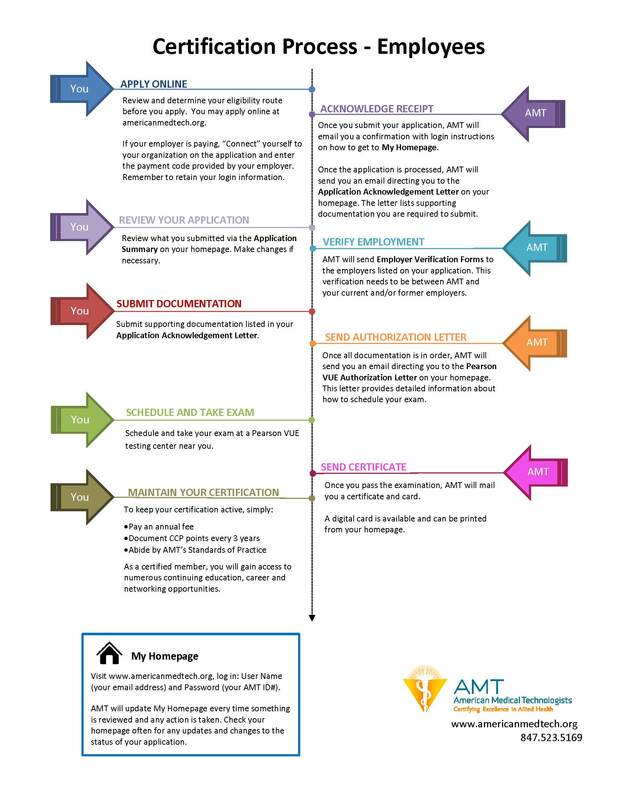 The application for a AMT certification program is all online. It is easy to apply! Each student is set up with a personal homepage with all their information in one place. A confirmation is sent immediately to the email submitted on the application. Please encourage your students to track their status online using the login information provided in the email. Allow 1 - 2 weeks for initial processing of an application. Contact AMT with any questions: srp@americanmedtech.org or 847-823-5169 Ext 390. If your school pays for applications (which includes cost of exam) or practice exams, consider purchasing in bulk from AMT. When planning your purchase, please note that exam applications are valid for one year. To purchase applications or practice exams in bulk by credit card, login to “My Homepage” for your school’s AMT account. Choose the option under “Bulk Purchasing” and follow the instructions. Once the purchase has been completed, your school will receive a confirmation both on screen and sent to the email address associated with the account. The confirmation contains the coupon code, which is the invoice number. That coupon code can be shared by you with your students to apply online. In the case of practice exams, the coupon serves as the registration “Event” code. (Bulk purchase requires login) SRP Portal. To purchase applications or practice exams in bulk by check, send the following information to American Medical Technologists, 10700 W. Higgins Rd, Suite 150, Rosemont, IL 60018. Attn: SRP Dept. Once we have processed your order, we will email you a code that can be used by your students to apply and/or purchase the practice exam online. Schools that would like to use a purchase order (PO) for bulk applications can request that by phoning the School Resources Program team at 847-823-5169, ext. 390. Only applications for certification exams are available through POs; practice exams are not. SRP Portal. Contact srp@americanmedtech.org for more information. 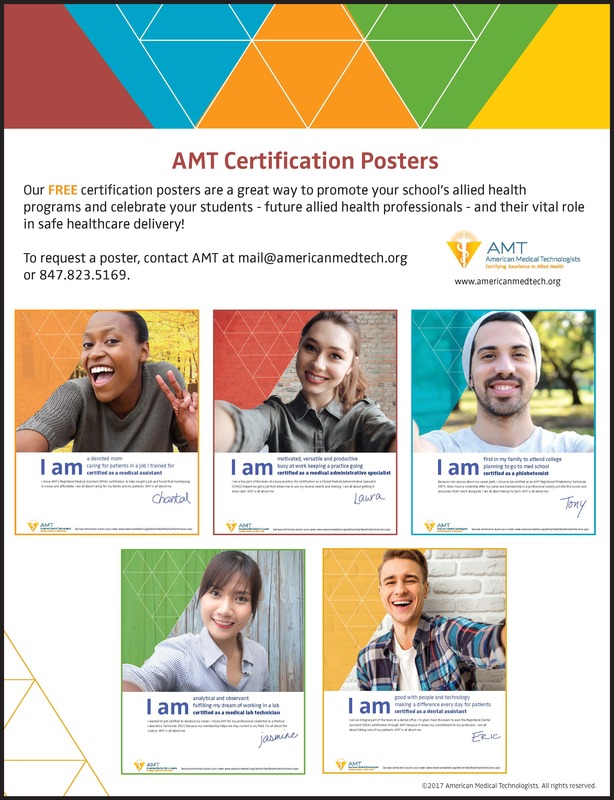 Posters: Posters, sized 24” x 18”, highlight each certification specialty. Student Brochure: Quick reference tri-fold for students beginning their application. Have a success story or a group or event that you’re proud of? Promote your students, your school, your program through the AMT website and social media. Send us the story and include the name of your school/campus, program director or instructor and images or stories about a celebration or an accomplishment related to your allied health program. Follow us on social media and encourage your students to as well. Show your school pride and let your medical assistant students shine by demonstrating their knowledge at the Medical Assistant Student Challenge Bowl. This one-day educational competition is open to all medical assistant students who will be enrolled in institutions offering a Medical Assistant program at the time of the competition. The 2019 Bowl will be held early July during the AMT Education Program and National Meeting in Chicago, IL. The purpose of this academic tournament is to provide opportunities for professional camaraderie, sportsmanship, and networking with their peers from various states. The medical assisting students compete by answering administrative, clinical and general questions about medical assisting.